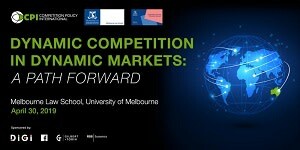 The Competition Law and Economics Network is a network of people engaged in research, teaching and other activities in areas related to competition law and economics at the University of Melbourne. The Network has been established by the Melbourne Law School, but has members and encompasses activities from other University of Melbourne faculties - particularly the Faculty of Business & Economics and the Melbourne Business School. The Network thus reflects the interdisciplinary nature of this field of regulation. Information about the key leaders of the Competition Law and Economic Network. Members of the Network are individuals affiliated with the University of Melbourne who contribute to the research and/or teaching activity of the University in relevant areas. The Network benefits from advice and support from key advisors who are senior members of the profession. The University's Graduate Researchers undertaking research at doctoral or masters level in competition law or economics-related fields are also associated with the Network. The Competition Law and Economics Network has engaged in research covering many issues which are of significance to Australians. A major research project on the regulation of the Australia retail grocery sector, being undertaken over the period 2015–2018, led by CLEN Direct Professor Caron Beaton-Wells. CLEN members have been involved in a research project funded by the Melbourne School of Government, relating to petrol pricing. Serious cartel conduct is taken to refer to four collusive practices between competitors - price fixing, market sharing, output restriction and bid rigging. Useful links to a number of organisations. The Melbourne Law Masters offers one of the world's largest programs in graduate law. It has 22 specialties, of which the Competition and Consumer Law speciality is one. Small class sizes (average 25) and high-calibre, intensive mode teaching by local and international experts ensures a challenging and rewarding learning experience. Enrolment is open to lawyers and non-lawyers (with suitable work experience). The Masters and Graduate Diploma courses in Competition and Consumer Law in the MLM program are the only specialist qualifications in competition and consumer law available in Australia. Alternatively, students can enrol in competition law subjects in the Melbourne Law Masters program as single subjects (ie not towards a diploma or degree), either on-campus or online. For more information on Competition and Consumer Law and the program generally, visit the website contact or the Director of Studies Professor Caron Beaton-Wells. See our VIDEO providing a course overview. This is a highly sought after subject offered in the Melbourne Law School's JD optional programme. The subject is about the legal regulation of markets as a means of preserving and promoting competition in Australia. The subject focuses on the way in which anti-competitive practices are regulated under Part IV of the Competition and Consumer Act 2010. Students also learn about enforcement mechanisms as well as the roles played by regulatory authorities and the courts in enforcing provisions of the Competition and Consumer Act. While it canvasses the policy objectives and challenges of competition regulation, the subject is applied in its orientation in that it encourages students to explore the practical applications of the law in the context of real-life trade and commerce. The Melbourne Law School teaches a wide range of breadth subjects for non-law students in the University's undergraduate degrees. These include a subject on Competition and Consumer Law, taught by Law School Senior Lecturer and CLEN Deputy Director, Arlen Duke. Details are on the law breadth website here. This subject addresses the economic principles underlying various areas of the law and which are relevant to legal practice. Three main issues are studied. The first is competition law and consumer protection. The second is property rights, including intellectual property. The third main area concerns issues of damages and compensation. The course develops economic tools to analyse these legal issues. These include incomplete contracting, oligopoly analysis and incomplete information. Behavioural economics extends traditional economics by incorporating insights into human behaviour derived from psychology and sociology. The behavioural patterns studied in this subject include judgement biases, mental accounting, framing, loss aversion and anchoring, present-biased preferences, fairness, negative reciprocity and visceral influences. Applications of behavioural economics to both microeconomic and macroeconomic topics are considered, such as self-control, wage rigidity and involuntary unemployment, social capital and the equity premium puzzle. Research techniques emphasised in behavioural economics, such as experimental methods, are discussed. An introduction to advanced microeconomics and to the economics of information and strategic behaviour. Topics covered include decision making under uncertainty, the interaction of primal and dual methods of modelling producer and consumer behaviour, the existence and welfare properties of general equilibrium, the theory of market failure and public goods, models of strategic behaviour in oligopoly, an introduction to game theory. This subject provides an overview of selected topics in industrial organisation. Industrial organisation deals with the structure, management and performance of firms and markets. The main emphasis is on theoretical principles although there will be some discussion of empirical approaches. Topics covered include the theory of the firm, monopoly and durable goods, price discrimination, oligopoly pricing, product choice, dynamic price competition and tacit collusion, search and market intermediaries, signalling and limit pricing, product differentiation, advertising, entry and exit, research and development, and vertical relationships between firms. For more information on Competition and Consumer Law and the program generally, visit the website or the Director of Studies Professor Caron Beaton-Wells. CLEN network members organise a range of activities and events and also contribute to a variety of bodies, committees and associations in Australia and abroad concerned with the advancement of competition law and economics. CLEN events are intended for a wide audience, including practitioners, academics, and graduate students interested in these topics. Read or listen to the CLEN Director, Professor Beaton-Wells, discuss the ACCC’s inquiry into digital platforms and new frontiers in competition law. Contact with the Competition Law & Economics Network should be made through its Director, Professor Caron Beaton-Wells or one of its Deputy Directors, Arlen Duke or Dr Rhonda Smith. Caron Beaton-Wells and Jo Paul-Taylor. b) Why should government get involved? c) So what are the options?